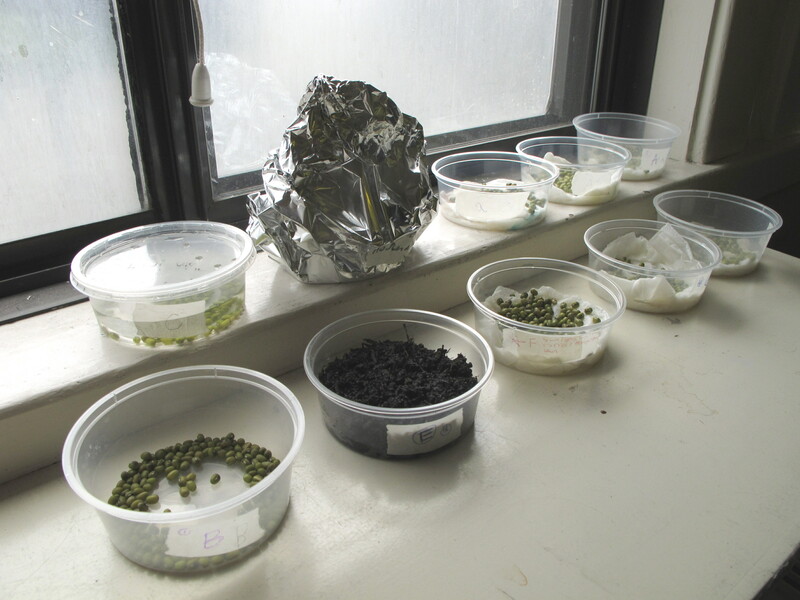 Grow mung bean seeds in tubs under different conditions (oxygen, water, light, and maybe other variables suggested by students) to find out what they need to germinate. Mung bean seeds, 15-20 per tub. Optional: soak in water a couple of hours before the activity to speed up germination without changing the appearance of the seeds. Tub for each condition at each table group (I use cream cheese/deli tubs - they are shallow and stable). Plants come from seeds. Why don’t these seeds turn into plants? They need certain conditions to germinate. We’ll test what seeds need to grow into plants. 1. seeds on wet paper towel (get water and air and light) - crunch up a paper towel in the bottom of the tub, wet it, then lay over a folded paper towel to make a damp, flat surface for the seeds. Layer some saran wrap over the top with small holes punched in it, to let in the light, but keep water from evaporating away as fast. 3. seeds under water (get water and light, no air) - put seeds in a tub filled with water. 4. seeds on wet paper towel wrapped in foil (get water and air, no light) - set up as 1 then wrap in foil to keep the light out. Open each day briefly to let plenty of oxygen in. Optional: make predictions about what will happen. Doesn’t matter whether you are right or wrong. It just gets you thinking about it. Leave tubs in a warm spot for a week. Make sure the wet conditions stay wet - check at least once a day. 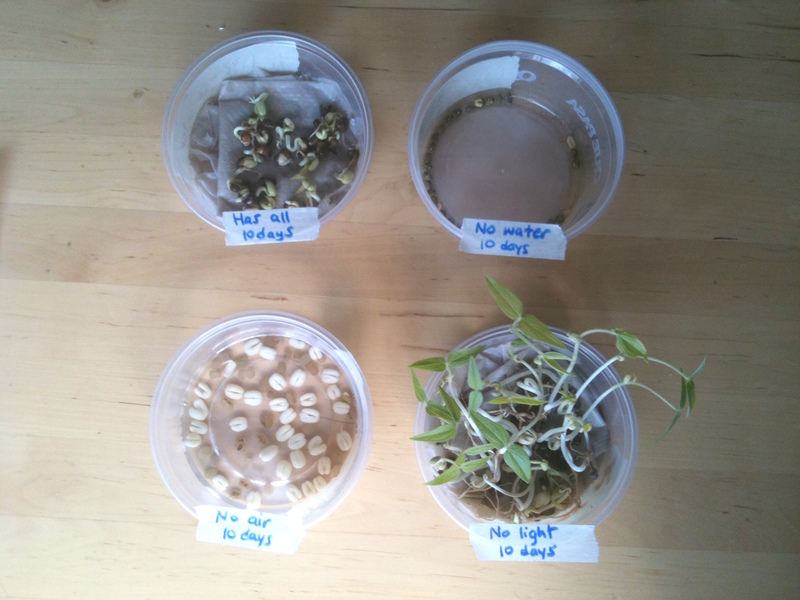 The seeds under water will need to have their water changed, so that mould growth does not take over. Did you have a look during the week at your seeds? What did you notice? Look at all your experiment dishes. What do you see? The long white thing coming out of the seed is the root, and comes first. Then the shoot, which is green, and might have distinct leaves. Record average root and shoot length for each of the tubs. 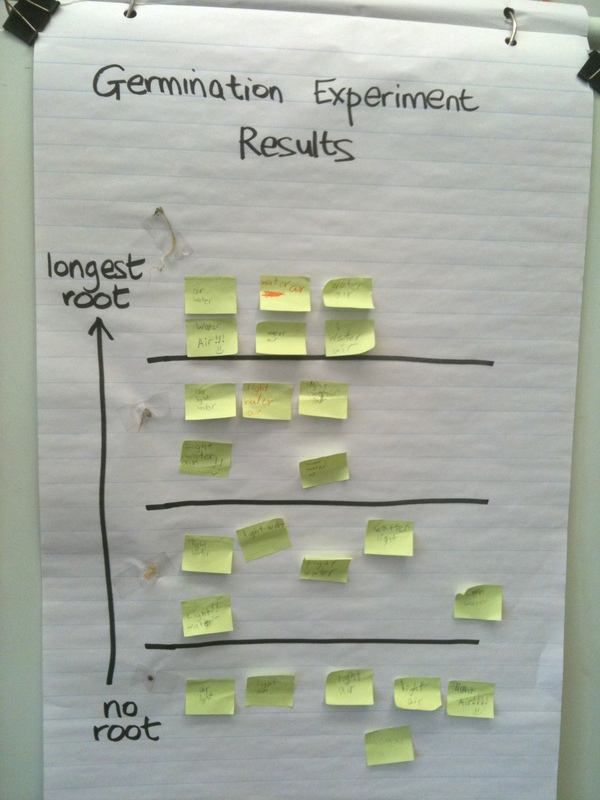 Combine results into a class chart. 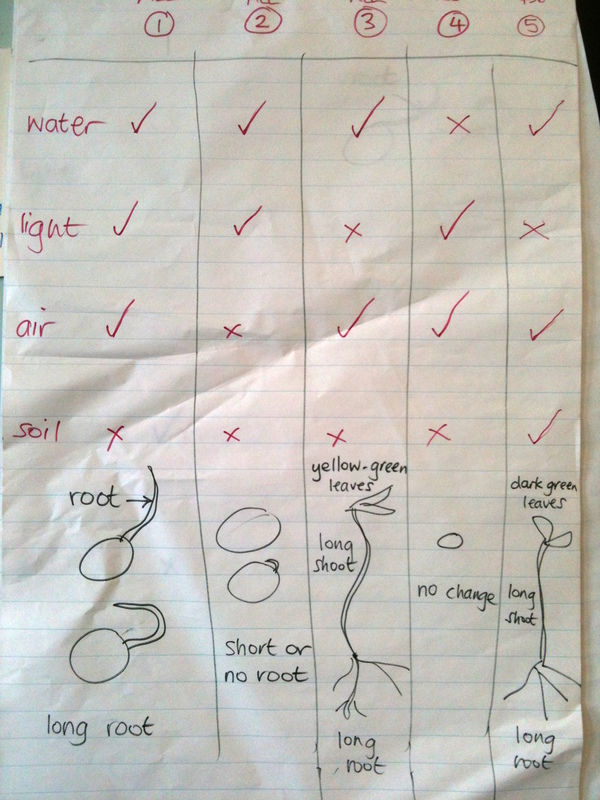 The seeds in the dark with water and oxygen grew the most in a week - they had long roots and many had shoots too. The seeds with water in the light grew the next best. They had roots, but they had turned brown at the ends and very few had shoots. The seeds with water but no oxygen grew the next best. They had split open and had sent out a root, but it stopped growing pretty quickly. The seeds with no water did not grow at all. 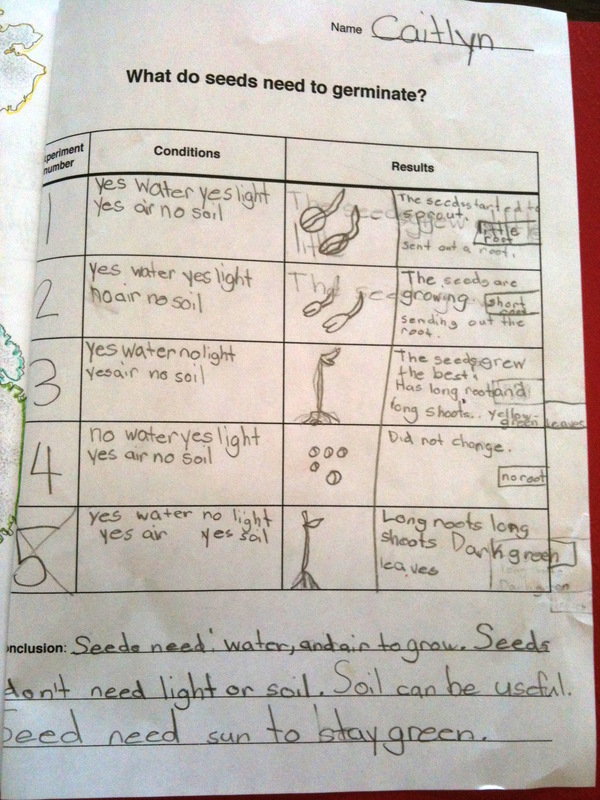 Conclude as a class what seeds need to germinate (water, air, darkness). Seeds with soil grow well (they have darkness, wet, oxygen and also nutrients from the soil). Seeds in the cold do not grow well (discuss: seed germination is triggered by the warmth of spring). Seeds that are damaged sometimes germinate (discuss: probably depending on whether the embryo is been damaged or just the cotyledons). 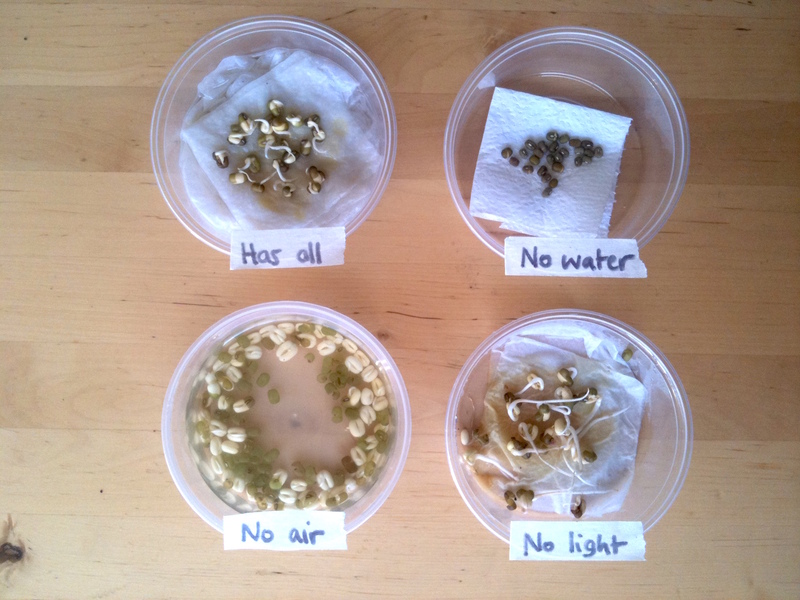 Continue the experiment with the plants that are growing OK (should be the seeds in the darkness either on the wet paper towels or in soil), to find out what the plants need once they have germinated. Results should show that plants need light when the leaves appear. With no light, the leaves are present but pale green. Mung bean seeds need darkness to germinate well. But this is apparently not always the case. Other plants need light, or are not affected by light conditions for germination to happen. With a grade 3 class, I suspected that some of the students took away that plants need darkness, missing the subtlety that they need darkness for germination, then light for growth once the leaves are formed. If the plants are allowed to grow more once the leaves are formed, distinguish between germination, and subsequent plant growth after leaf formation. If seeds are soaked beforehand, do not do for so long that they are already making roots. (Overnight soaking is too long). Giving the students dry seeds to start takes a little longer to get going, and gives slightly more variable results.